While I was away in late May and early June, about 500 students from across Oregon visited Sumpter on school field trips. Some only rode Sumpter Valley Railroad Restoration’s historic steam train and visited the Sumpter Valley Dredge State Heritage Area. More did that AND visited the Sumpter Municipal Museum and took part of the historic walking tour, with accompanying historic photographs. Most who did the walking tour made it as far as Auburn Street. The walking tour started in front of the Museum. Join me now for a taste of what the students saw and heard from their tour guide. 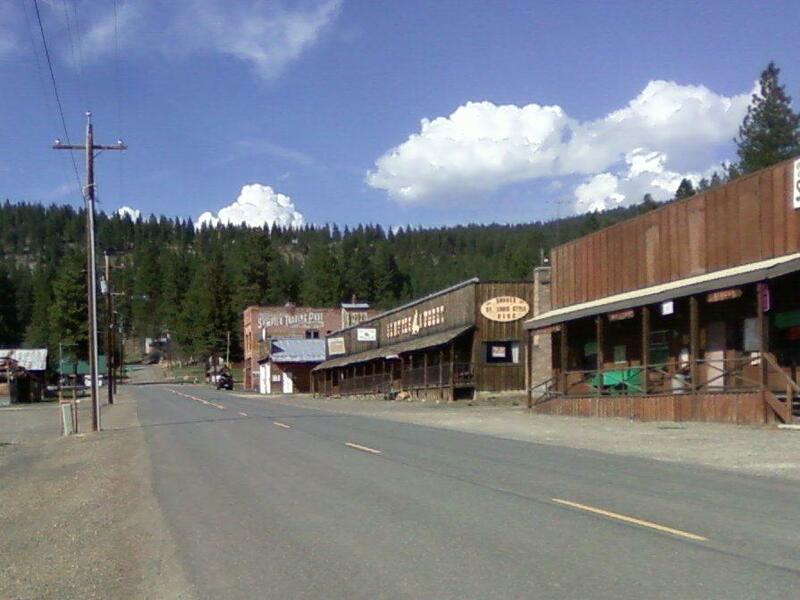 “Welcome to Sumpter, founded in 1862. 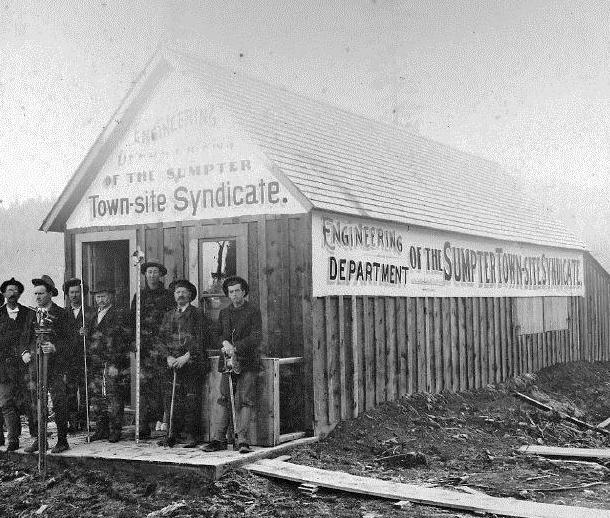 Last year Sumpter had its 150th birthday. The Museum here was built in 1899. It has served as a store and a gas station. We’re still trying to figure out anything else it might have been. The blank concrete you’re standing on is where the gas pumps were. This is where I caught the school bus. 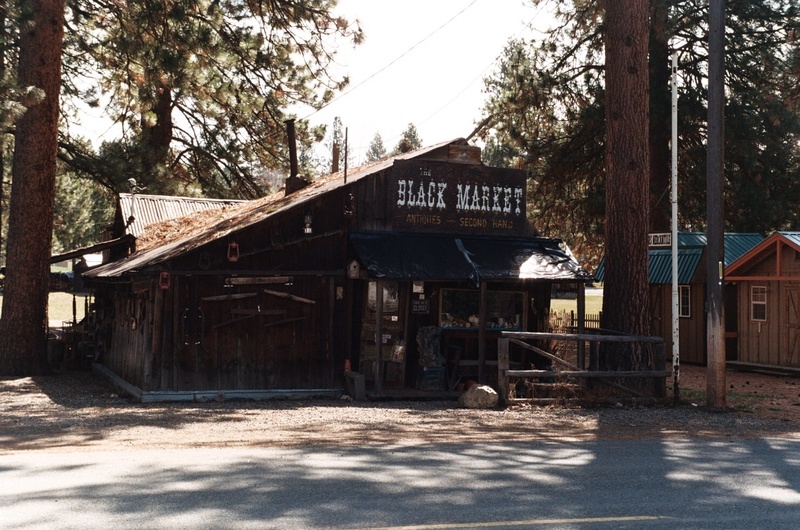 Across the street stands the Black Market, an antiques store. 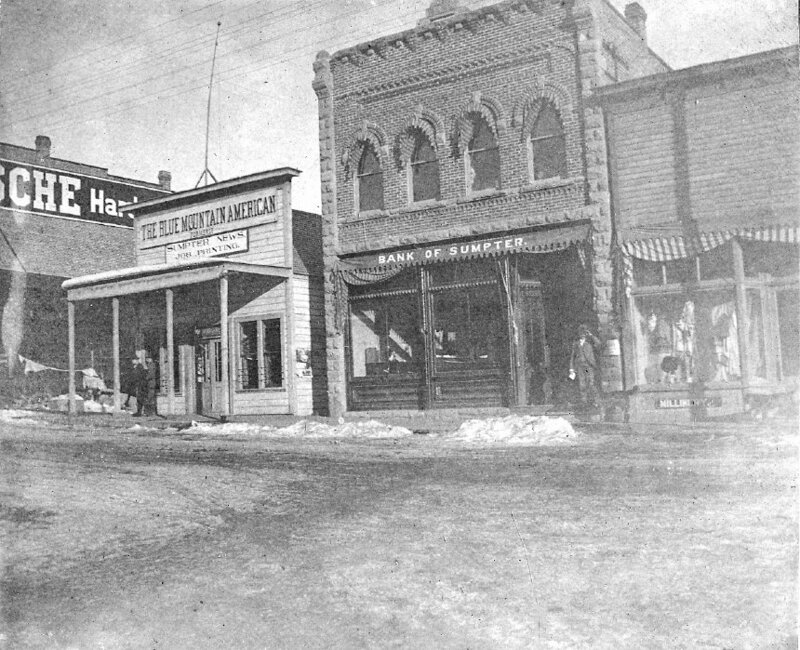 The students then walked north along Mill St to the Sumpter Townsite Syndicate office building (discussed and displayed photographically in previous posts “Brewing Up Trouble” and “The Modern Troughs”). The attention of the students was called to the wall on the north side of the building, which was built at an acute angle from the front wall rather than at a ninety-degree angle. 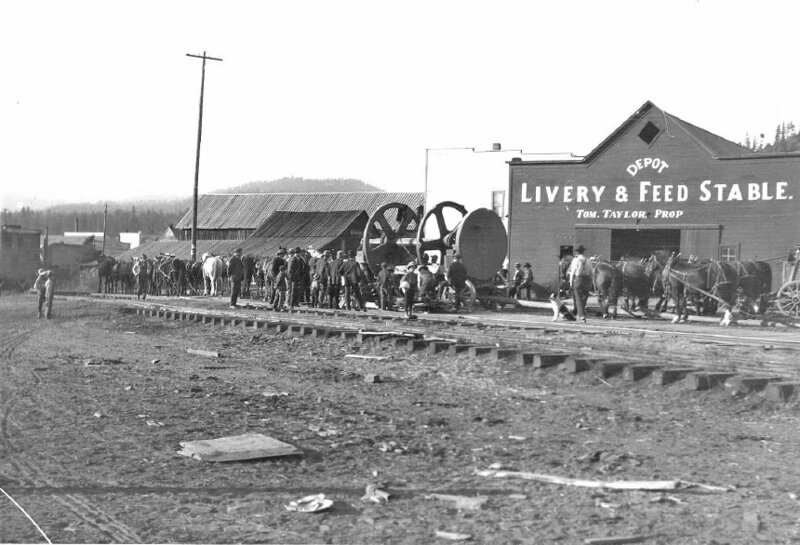 … they were urged to imagine a brewery, bakery, bank, newspaper office, and hardware store. Over there had stood a feed store (see also previous posts “Looking Both Ways” and “The Round Trough”). 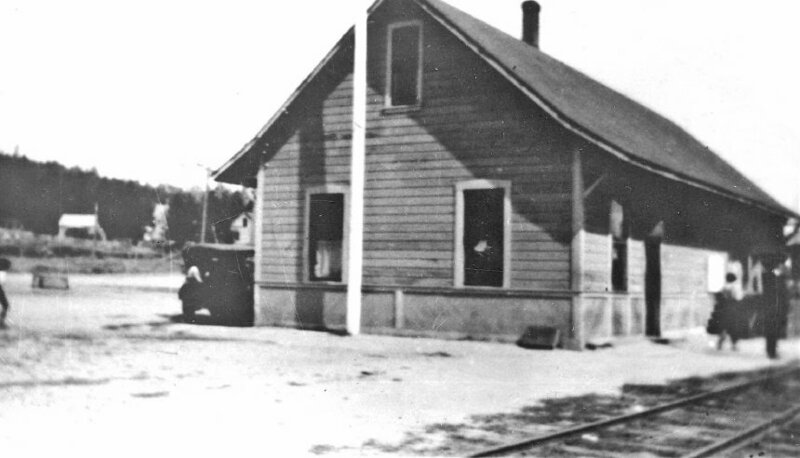 “The train came into town this far, and the depot stood there. 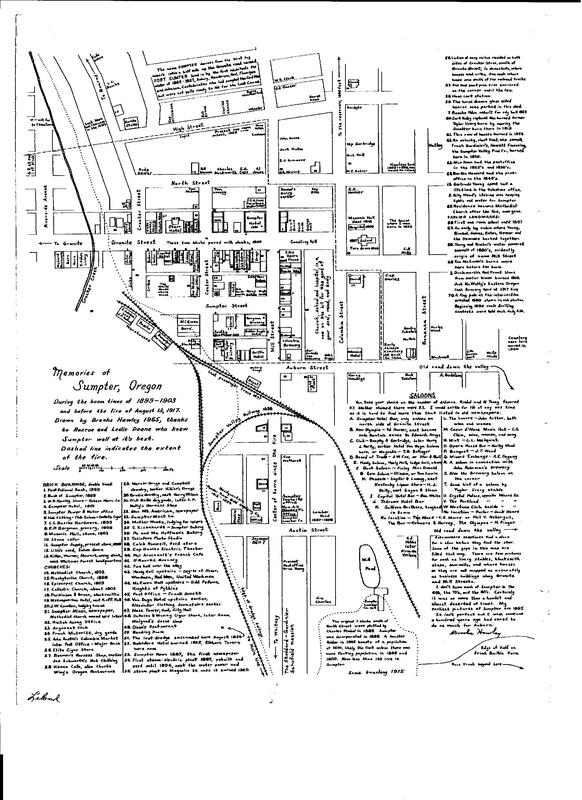 “… was a livery stable where they parked their horses and walked the two blocks to where the real downtown was with its hotels, restaurants, cigar store, drug store, and lots of other businesses. 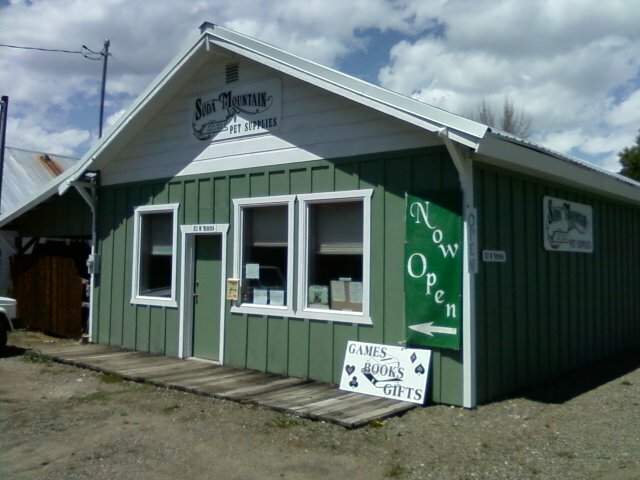 “See the building that says Sumpter Trading Post? 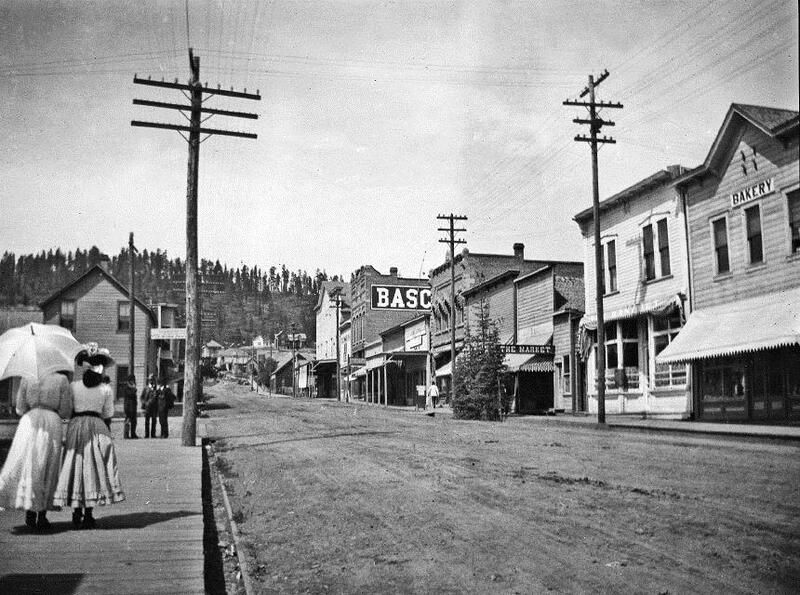 In the 1910 photo, it said Basche, and it was also built in 1899. The Basche Hardware building burned, but the bricks of the many other destroyed brick buildings in town were used to rebuild it [see also previous post “North Mill Street: Basche Hardware and Ellis Opera House”]. It was used as City Hall from the 1920s to the 1970s, when the new City Hall was built. We had lots of potlucks and I was in Christmas programs in there, too. “Where the new City Hall stands now, on this side of the Basche building, is where a newspaper office was. 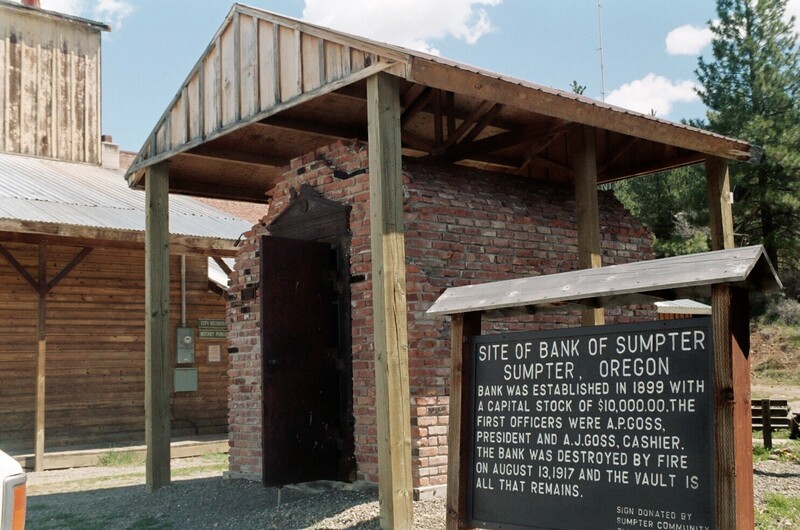 Next to that was the Bank of Sumpter. In the 1917 fire, the bank burned down and all that was left was the vault. When I was growing up, people would come look at the vault and say, ‘Oh, there was an old building here.’ Then they’d take a brick. I remember they put up a fence so not all the bricks would disappear. Only one group of students had the time to sneak up as far as the vault. No one had time to visit Granite St. But they did a good job imagining old Sumpter right from Auburn St.